Shaleez is an Argonian assassin hiding out in the Flooded Mine, located just north of Bravil, near the coast. She is a high-ranking member of the Dark Brotherhood who eventually falls victim to the machinations of Mathieu Bellamont when he tricks Lucien Lachance's silencer into hunting down and killing her and a number of other Black Hand members. Shaleez has the basic life of a fish; eat, sleep & swim. She sleeps in Flooded Mine from 10pm until 5am. She will then wander around Flooded Mine until having her breakfast at 6am for two hours. For the rest of the day, she will either swim or walk around Flooded Mine from 8am till bedtime. 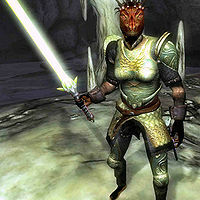 Shaleez wears a partial suit of leveled light armor, save for the gauntlets, which she substitutes with a leather bracer, and the boots and helmet, which she does without entirely. In combat Shaleez relies on two leveled and enchanted blades, one short and one long (as well as a generally unused unenchanted shortsword). As a member of the Black Hand, Shaleez has permanent resist magic 50% and resist normal weapons 50% abilities. During the Final Justice quest, the player is assigned to eliminate a "known psychotic", Shaleez. Fighting her in the water of the Flooded Mine can be difficult, so luring her out of it is advisable. Once Shaleez is dead, you can travel to the next dead drop to begin A Matter of Honor. Even though it is said that she is a Silencer, in the construction set she is classed as a Dark Brotherhood Elite. The only usage for such a title is that when you kill her, you will not receive a bounty. Esta página foi modificada pela última vez à(s) 21h29min de 15 de dezembro de 2012.